To Cite: Vafapoor H, Zakiei A, Hatamian P, Bagheri A. Correlation of Sleep Quality with Emotional Regulation and Repetitive Negative Thoughts: A Casual Model in Pregnant Women, J Kermanshah Univ Med Sci. 2018 ; 22(3):e81747. doi: 10.5812/jkums.81747. Background: Given the significance of sleep quality among pregnant women and its effects on the health of the fetus and pregnant mothers, the present study aimed to investigate the correlation of quality of sleep with repetitive negative thoughts and emotional dysregulation among pregnant women. Methods: In this correlational descriptive study, 300 pregnant women, residing in Kermanshah and presenting to OB/GYN offices during a month, were selected through convenience sampling. Three questionnaires were utilized for data collection: repetitive negative thoughts, emotional dysregulation, and Pittsburgh sleep quality index (PSQI). Finally, the data was analyzed in SPSS V. 21 and Amos V. 21. Results: The results of the present study revealed that all components of emotional dysregulation were positively correlated with quality of sleep, and there were significant relationships between all three components of repetitive negative thoughts and quality of sleep. Further, the results indicated that repetitive negative thoughts could the quality of sleep (0.22) (P < 0.009). However, emotional dysregulation did not have any significant direct effects on the quality of sleep. In other words, emotional dysregulation was found to affect the quality of sleep through repetitive negative thoughts (0.15), (P < 0.01). Conclusions: According to the results of the present study, it was concluded that the quality of sleep was reduced by emotional dysregulation when repetitive negative thoughts were high. Therefore, it can be concluded that negative repetitive thoughts have a negative influence on the quality of sleep. Although pregnancy is an enjoyable period in a woman’s life, it is often accompanied by stress and physiological-psychological changes (1). In fact, the systematic hormonal, psychological, emotional, and physical changes that occur during pregnancy may challenge the sleep quality of pregnant women and cause sleep problems (2). It is claimed that sleep problems are a painful challenge in 79% of pregnant women (3). The prevalence of sleep disorders and sleep quality problems have been reported by several researchers (4-6). According to domestic studies, 87.2% of pregnant women are faced with sleep quality problems (7). Sleep quality problems can entail such problems as increased anxiety in childcare or postpartum depression (8). It can also cause other problems such as preterm labor and low birth weight (9). Changes in pregnant women’s sleep quality can entail changes in maternal attitude toward the experience of pain and labor and accepting the motherhood role (10). Sleep problems in pregnant women can adversely affect mothers and infants in both short and long terms. Factors that hasten neonatal growth even in embryonic stage and after infancy are directly and indirectly associated with maternal psychological health. One of the main aspects of individual’s health is the quality of sleep because disturbed quality of sleep can facilitate and increase negative modes of behaviors and thoughts in people, moreover, many physical, affective and emotional factors can disrupt the sleep cycle and cause sleep disturbances (11). Importantly, emotional dysregulation is one of the main features in 75% of psychological disorders (12, 13). Emotional regulation refers to responsible internal and external processing, evaluation, and identification of emotional reactions (14). Review of psychology literature shows that emotional regulation is a major determinant of health and successful social interactions (15). In addition, it is currently claimed that emotional dysfunction is manifested in all psychiatric disorders (16). With regard to sleep, the results obtained by Lund et al. confirm the role of emotions in sleep disorders (17). Therefore, emotional regulation problems are regarded as a predictor of insomnia. Emotional regulation is one of the transdiagnostic emotional variables associated with repetitive negative thoughts, and includes strategies used by people in manifesting and exacerbating a wide range of emotions (18). Reviews indicate that repetitive negative thoughts are the main transdiagnostic factor in many psychological disorders including sleep disorders (19). Morin and Barlow argued that cognitive arousal causes insomnia more than physiological arousal does, and it can manifest as worry, mental rumination, disturbing thoughts, and problems in controlling emotional thoughts (20). Previous studies also support this theory; for instance, the results of a study showed that people with poor quality of sleep had higher levels of rumination and negative cognitions than others (21). However, most studies refer to the direct relationship of repetitive negative thoughts (including rumination and worry) with sleep disturbances and sleep quality, and no study has yet investigated or provided a model for the combination of these variables in pregnant women. Given the importance of sleep quality in pregnant women and its effect on fetal health, and also insufficient number of studies in this field, the present study seeks to identify some of the psychological factors associated with sleep quality in pregnant women. In fact, the present study was conducted to determine the relationship of repetitive negative thoughts and emotional dysregulation with sleep quality in pregnant women. The present descriptive-correlational study recruited 300 pregnant women living in the city of Kermanshah and attending obstetrics and gynecology clinics in a month for prenatal cares who were selected by convenience sampling method. The study inclusion criteria were no use of cigarettes, opioids, alcohol, hypnotics and hormonal medications, and willingness to take part. Women suspected of using narcotics, smokers, and those with a history of depression and anxiety were excluded. Given the correlational nature of the study, and based on Morgan’s table, the sample size was determined 300 women, which was raised to 330 women, taking into account unwillingness to cooperate and withdrawals, but ultimately, data from 300 women were analyzed. Given unavailability of real statistics of attendees, sampling was conducted based on availability of samples. The prepared questionnaires were given to the selected subjects, who received necessary explanations about completing the questionnaires by the researcher. The participants were asked to confer with the researcher, should they have any problems with completing the questionnaires. To observe ethical principles, the participants were informed that they could withdraw from the study if they were unwilling to cooperate. The selected subjects declared their consent to take part, were assured of confidentiality of data, and then completed the questionnaires. The questionnaires were individually completed in the presence of the researcher and collected. Participation in the study was totally voluntary and with informed consent. The participants were allowed to complete the questionnaires once they had been briefed about the study and its objectives. They were assured of confidentiality of data, and the fact that data will not be made available to any organization or individual. A self-reporting questionnaire developed by Buysse in 1989. This is a standard questionnaire with 18 items in seven components as follows: (1) Subjective sleep quality with one item (item 9); (2) sleep latency whose score is the mean score of item 2 and part (A) of item 5; (3) sleep duration with one item (item 4); (4) sleep efficacy, whose score is found by dividing total hours of sleep by total hours spent in bed times 100; (5) sleep disturbances, whose score is the mean score of item five; (6) use of hypnotics with one item (item 6); and (7) daytime dysfunction with two items (mean scores of items 7 and 8). Each item scores from 0 to 3 points, and maximum score of each component is 3 points. The score of these seven items together form the total score, which ranges from 0 to 21 points, where higher scores indicate poorer sleep quality. Scores higher than 5 imply unfavorable sleep quality. Reliability of the Persian version of PSQI has been confirmed with Cronbach’s alpha of 0.83 (22). This is a 36-item questionnaire with six subscales, including non-acceptance of emotional responses, difficulty in conducting intentional behaviors, difficulty in impulse control, lack of emotional awareness, limited access to emotion regulation strategies, and lack of emotional clarity. The overall internal reliability is 0.93, and for each subscale, 0.85, 0.89, 0.86, 0.80, 0.88, and 0.84, respectively. Alavi et al. reported an overall internal consistency of 0.86. Higher scores indicate poorer emotional regulation (23). This questionnaire was developed by McEvoy in 2010 to assess repetitive negative thoughts with 31 items in a 5-point Likert scale. Cronbach’s alpha coefficient has been reported between 0.72 and 0.93. The predictive validity was determined by the correlation coefficients of this questionnaire and Beck’s DASS (0.42 and 0.38, respectively) (19). Reliability of the Persian version of this questionnaire was confirmed by Khaleghi et al. (cited in Akbari et al.) with Cronbach’s alpha of 0.89 (24). Table 1 presents demographic details of participants. Table 2 shows the mean and standard deviation of variables and correlation coefficient of sleep quality with emotion regulation problems and repetitive negative thoughts. The results presented in Table 2 show a significant and positive relationship between all emotional regulation problems (except for lack of emotional transparency) and sleep quality, with a correlation coefficient of 0.23, which is significant at 0.001. The results also showed a positive and significant relationship between all three subscales of repetitive negative thoughts and sleep quality, with a correlation coefficient of 0.35, which is significant at 0.001. Before presenting the study model, the role of emotional regulation problems in predicting sleep quality was assessed using regression analysis, and the results showed that these problems can predict 8% of changes in sleep quality and of all components of these problems, only limited access to emotional regulation strategies can predict sleep quality with β = 0.27, and the remaining component cannot individually predict sleep quality. The relationship of emotional regulation problems and sleep quality with the mediating role of repetitive negative thoughts was investigated using structural equation path analysis. The study model is presented in Figure 1. The model shows that emotional regulation problems and repetitive negative thoughts can predict 12% of variance of sleep quality. The results presented in Table 3 show that the proposed study model has a good fit. The results of structural equation path analysis are shown in Table 4. The results obtained from path analysis show that direct effect of emotional regulation problems on repetitive negative thought is 0.66 (P < 0.001), and direct effect of repetitive negative thoughts on sleep quality is 0.22 (P < 0.009). However, emotional regulation problems have no direct and significant effect on sleep quality, which means that these problems indirectly affect sleep quality through repetitive negative thoughts (0.15) (P < 0.01). The present study was conducted to determine the relationship of repetitive negative thought and emotional regulation problems with sleep quality in pregnant women. The results showed a significant relationship between repetitive negative thoughts and sleep quality of pregnant women, which means the higher repetitive negative thoughts are, the poorer sleep quality of pregnant women will be, and the lower these thoughts are, the better their sleep quality will be. The present study results so far agree with those of previous studies (21, 25, 26). The results of a study by Slavish and Graham-Engeland to provide a model for prediction of sleep quality based on depression and anxiety mediated by rumination in a sample of 165 people, revealed a relationship between sleep quality and depressive and anxious mood through rumination (27). The results obtained by Thomsen et al. 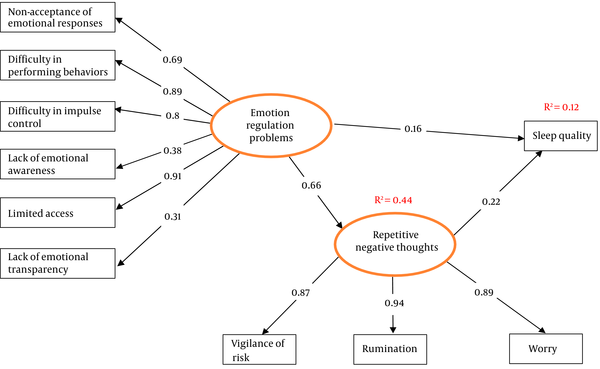 in a sample of 126 individuals showed a significant relationship between sleep quality and rumination (26). A study by Poormohseni to investigate and compare the role of repetitive negative thoughts in the form of worry and rumination in sleep disturbances in a sample of 60 students with normal and disturbed sleep showed that sleep disturbances are correlated with rumination, worry and its dimensions. Also, rumination and worry are able to predict sleep disturbances (28). It can be concluded from comparison of previous studies (cited above) and the present study that repetitive negative thoughts and rumination have a negative role in sleep quality, and although the present study was conducted on a different population and in a specific setting, repetitive negative thoughts still had a negative role in sleep quality. Anxious and worried people have repetitive negative thoughts about adverse events (22) and their possible occurrence. This is the case in pregnant women, especially about their infant’s future. These thoughts lead to emotional and physiological arousal (23), which will lead to greater attention to environmental and personal stimuli, which may raise the individual’s heart rate and breathing, leading to reduced sleep quality. The confirmed relationship between repetitive negative thoughts and sleep quality in previous studies (24), explains the present study results with regard to this relationship. This finding can be explained by the fact that what concerned the participating pregnant women in the present study was the absence of a clear picture of their infant’s circumstances after birth. On the other hand, many primiparous women have doubtful attitudes toward childbearing, for instance, would they be freer if they were not going to have a child at this time, and would the circumstances not be better and problems less in the future? Such concerns and ruminations lead to poorer sleep quality of mothers. The present study results showed that emotion regulation has a relationship with depression, anxiety and stress (29-31), and these pave the way for insomnia (32). Furthermore, review of a previous study shows that there is a relationship between emotion regulation cognitive strategies and sleep quality (33). Other studies have reported that emotions affect sleep quality (34). Therefore, this part of the present study results agrees with previous studies, except that the direct effect of emotion regulation on sleep quality is not significant, which means that emotion regulation problems have no direct effect on sleep quality, but have a significant effect through repetitive negative thoughts. A person’s performance in psychological, cognitive, physiological and behavioral domains depends on emotion regulation, and proper emotion regulation leads to regulation of evaluations and subjective reactions, resulting in appropriate reactions in different aspects of life (35). The results of previous studies have shown that emotion regulation has a relationship with depression, anxiety and stress (29, 30). Given their condition, pregnant women may experience some levels of depression, anxiety and stress (36), and through these, emotion regulation problems can reduce sleep quality of these women, since these disorders can provide the context for reduced sleep quality (37). According to the present study results, repetitive negative thoughts have a direct and significant effect on sleep quality, but the direct effect of emotion regulation on sleep quality is not significant, which means that emotion regulation problems have no direct effect on sleep quality, but an indirect effect through repetitive negative thoughts. It is believed that depression, anxiety, and stress affect sleep quality (38). Furthermore, anxious and worried people have repetitive thoughts about negative events (39), and worry about their happening. The same applies to pregnant women who worry about their child’ future. These thoughts cause emotional and physiological arousals (40), which in turn make the individual pay greater attention to environmental and personal stimuli, which may be rather absorbed by heart rate and breathing, and their irregularity can lead to reduced sleep quality. Previous studies have shown that there is a relationship between repetitive thoughts and sleep quality (19). According to Harvey’s Theory, repetitive negative thoughts (worry and rumination) about the amount of sleep lead to emotional arousals and disturbances, and this entails mistaken bias in the perception of sleep function and duration, resulting in persistence of sleep disturbances. The present study results somehow support Harvey’s theory. Review of previous studies shows that people’s worry leads to cognitive-anxious arousal, resulting in increased autonomic nervous system activity. Since the present study enrolled pregnant women from Kermanshah, care should be taken in generalization of the results. It is better if a similar study is conducted in other communities and with a larger sample size to enhance generalizability of the results. It is recommended that future studies consider the cause and effect relationships of these variables in the form of an experimental project. Moreover, since the present study healthy pregnant women participated in this study, it is recommended that future studies include pregnant women with particular diseases as well as infertile women. Given the present study results, to improve pregnant women’s sleep quality, it is recommended that the role of emotion regulation problems and repetitive negative thoughts be taken into account. The present study was conducted in Kermanshah province using convenience sampling, and thus care should be taken in the generalization of the results, further studies in other communities are needed. According to the results obtained, sleep quality of pregnant women is related to repetitive negative thoughts and emotion regulation problems. Moreover, emotion regulation problems reduce sleep quality when there is a high level of repetitive negative thoughts. Therefore, the role of repetitive negative thoughts should be considered in solving sleep problems. Hence, health authorities are recommended to use psychiatric services to improve the sleep quality of pregnant women. The authors wish to express their thanks to all those who helped in the present study, especially the Research and Technology Deputy of Kermanshah University of Medical Sciences, and all participants for their patience. Authors’ Contribution: Authors have made equal contributions to the present study. Funding: The present study had received no funding. 1. Sieber S, Germann N, Barbir A, Ehlert U. Emotional well-being and predictors of birth-anxiety, self-efficacy, and psychosocial adaptation in healthy pregnant women. Acta Obstet Gynecol Scand. 2006;85(10):1200-7. doi: 10.1080/00016340600839742. [PubMed: 17068679]. 2. Lopes EA, Carvalho LB, Seguro PB, Mattar R, Silva AB, Prado LB, et al. Sleep disorders in pregnancy. Arq Neuropsiquiatr. 2004;62(2A):217-21. [PubMed: 15235720]. 3. Morgenthaler TI, Kapur VK, Brown T, Swick TJ, Alessi C, Aurora RN, et al. Practice parameters for the treatment of narcolepsy and other hypersomnias of central origin. Sleep. 2007;30(12):1705-11. [PubMed: 18246980]. [PubMed Central: PMC2276123]. 4. Neau JP, Texier B, Ingrand P. Sleep and vigilance disorders in pregnancy. Eur Neurol. 2009;62(1):23-9. doi: 10.1159/000215877. [PubMed: 19407452]. 5. Lee KA. Alterations in sleep during pregnancy and postpartum: A review of 30 years of research. Sleep Med Rev. 1998;2(4):231-42. [PubMed: 15310494]. 6. Okun ML, Luther JF, Wisniewski SR, Wisner KL. Disturbed sleep and inflammatory cytokines in depressed and nondepressed pregnant women: An exploratory analysis of pregnancy outcomes. Psychosom Med. 2013;75(7):670-81. doi: 10.1097/PSY.0b013e31829cc3e7. [PubMed: 23864582]. [PubMed Central: PMC3926698]. 7. Ali Babaie N, Purhashemi S. Investigating the relationship between mental health and insomnia in pregnant women referred to health centers in Estahban. Makara J Health Res. 2016;19(3). doi: 10.7454/msk.v19i3.5639. 8. Lee KA, Gay CL. Sleep in late pregnancy predicts length of labor and type of delivery. Am J Obstet Gynecol. 2004;191(6):2041-6. doi: 10.1016/j.ajog.2004.05.086. [PubMed: 15592289]. 9. Smith MT, Neubauer DN. Cognitive behavior therapy for chronic insomnia. Clin Cornerstone. 2003;5(3):28-40. doi: 10.1016/s1098-3597(03)90033-0. 10. Lee KA, McEnany G, Zaffke ME. REM sleep and mood state in childbearing women: Sleepy or weepy? Sleep. 2000;23(7):877-85. [PubMed: 11083596]. 11. Sahota PK, Jain SS, Dhand R. Sleep disorders in pregnancy. Curr Opin Pulm Med. 2003;9(6):477-83. [PubMed: 14534398]. 12. Thielsch C, Ehring T, Nestler S, Wolters J, Kopei I, Rist F, et al. Metacognitions, worry and sleep in everyday life: Studying bidirectional pathways using ecological momentary assessment in GAD patients. J Anxiety Disord. 2015;33:53-61. doi: 10.1016/j.janxdis.2015.04.007. [PubMed: 26005837]. 13. Watts FN, Coyle K, East MP. The contribution of worry to insomnia. Br J Clin Psychol. 1994;33 ( Pt 2):211-20. [PubMed: 8038740]. 14. Thompson RA. Emotion regulation: A theme in search of definition. Monogr Soc Res Child Dev. 1994;59(2-3):25-52. [PubMed: 7984164]. 15. Cicchetti D, Ackerman BP, Izard CE. Emotions and emotion regulation in developmental psychopathology. Dev Psychopathol. 1995;7(1):1-10. doi: 10.1017/S0954579400006301. 16. Aldao A, Nolen-Hoeksema S, Schweizer S. Emotion-regulation strategies across psychopathology: A meta-analytic review. Clin Psychol Rev. 2010;30(2):217-37. doi: 10.1016/j.cpr.2009.11.004. [PubMed: 20015584]. 17. Lund HG, Reider BD, Whiting AB, Prichard JR. Sleep patterns and predictors of disturbed sleep in a large population of college students. J Adolesc Health. 2010;46(2):124-32. doi: 10.1016/j.jadohealth.2009.06.016. [PubMed: 20113918]. 18. Gross JJ, Thompson RA. Emotion regulation: Conceptual foundations. In: Gross JJ, editor. Handbook of emotion regulation. New York: Guilford Press; 2007. p. 115-45. 19. McEvoy PM, Mahoney AE, Moulds ML. Are worry, rumination, and post-event processing one and the same? Development of the repetitive thinking questionnaire. J Anxiety Disord. 2010;24(5):509-19. doi: 10.1016/j.janxdis.2010.03.008. [PubMed: 20409676]. 20. Morin CM, Barlow DH. Insomnia: Psychological assessment and management. New York: Guilford Press; 1993. 107 p.
21. Ong JC, Shapiro SL, Manber R. Combining mindfulness meditation with cognitive-behavior therapy for insomnia: A treatment-development study. Behav Ther. 2008;39(2):171-82. doi: 10.1016/j.beth.2007.07.002. [PubMed: 18502250]. [PubMed Central: PMC3052789]. 22. Stewart CA, Auger RR, Enders FT, Felmlee-Devine D, Smith GE. The effects of poor sleep quality on cognitive function of patients with cirrhosis. J Clin Sleep Med. 2014;10(1):21-6. doi: 10.5664/jcsm.3350. [PubMed: 24426816]. [PubMed Central: PMC3869064]. 23. Alavi K, Modarres Gharavi M, Amin-Yazdi SA, Salehi Fadardi J. [Effectiveness of group dialectical behavior therapy (based on core mindfulness, distress tolerance and emotion regulation components) on depressive symptoms in university students]. Q J Fundam Ment Health. 2011;13(2):35-124. Persian. 24. Akbari M, Roshan R, Shabani A, Fata L, Shairi MR, Zarghami F. Transdiagnostic treatment of co-occurrence of anxiety and depressive disorders based on repetitive negative thinking: A case series. Iran J Psychiatry. 2015;10(3):200-11. [PubMed: 26877754]. [PubMed Central: PMC4749690]. 25. Carney CE, Harris AL, Moss TG, Edinger JD. Distinguishing rumination from worry in clinical insomnia. Behav Res Ther. 2010;48(6):540-6. doi: 10.1016/j.brat.2010.03.004. [PubMed: 20362977]. [PubMed Central: PMC2871974]. 26. Thomsen DK, Yung Mehlsen M, Christensen S, Zachariae R. Rumination-relationship with negative mood and sleep quality. Person Indiv Differ. 2003;34(7):1293-301. doi: 10.1016/s0191-8869(02)00120-4. 27. Slavish DC, Graham-Engeland JE. Rumination mediates the relationships between depressed mood and both sleep quality and self-reported health in young adults. J Behav Med. 2015;38(2):204-13. doi: 10.1007/s10865-014-9595-0. [PubMed: 25195078]. [PubMed Central: PMC4362854]. 28. Poormohseni F. [The impact of rumination and worry about sleep disturbances]. Daneshvar Med. 2014;21(108):1-12. Persian. 29. Rezaei AM, Azadi A, Ahmadi F, Vahedian AA. [Comparison of depression, anxiety, stress and quality of life in dormitories students of Tarbiat Modares University]. Iran J Nurs Res. 2007;2(5):31-8. Persian. 30. Desrosiers A, Vine V, Curtiss J, Klemanski DH. Observing nonreactively: A conditional process model linking mindfulness facets, cognitive emotion regulation strategies, and depression and anxiety symptoms. J Affect Disord. 2014;165:31-7. doi: 10.1016/j.jad.2014.04.024. [PubMed: 24882174]. 31. Tortella-Feliu M, Balle M, Sese A. Relationships between negative affectivity, emotion regulation, anxiety, and depressive symptoms in adolescents as examined through structural equation modeling. J Anxiety Disord. 2010;24(7):686-93. doi: 10.1016/j.janxdis.2010.04.012. [PubMed: 20472383]. 32. Spoormaker VI, van den Bout J. Depression and anxiety complaints; relations with sleep disturbances. Eur Psychiatry. 2005;20(3):243-5. doi: 10.1016/j.eurpsy.2004.11.006. [PubMed: 15935423]. 33. Karami J, Momeni K, Alimoradi F. [Prediction of sleep quality based on stress, depression and anxiety with role of mediator cognitive emotion regulation strategies in pregnant women]. Iran J Obstetrics, Gynecol Infertil. 2016;19(9):1-10. Persian. 34. Kahn M, Sheppes G, Sadeh A. Sleep and emotions: Bidirectional links and underlying mechanisms. Int J Psychophysiol. 2013;89(2):218-28. doi: 10.1016/j.ijpsycho.2013.05.010. [PubMed: 23711996]. 35. Gresham D, Gullone E. Emotion regulation strategy use in children and adolescents: The explanatory roles of personality and attachment. Person Indiv Differ. 2012;52(5):616-21. doi: 10.1016/j.paid.2011.12.016. 36. Zareipour MA, Sadaghianifar A, Amirzehni J, Parsnezhad M, Ayuoghi Rahnema V. [Exploring of depression, anxiety and stress in pregnant women referred to health centers of Urmia]. Rahavard Salamat J. 2017;3(2):19-30. Persian. 37. Benca RM, Peterson MJ. Insomnia and depression. Sleep Med. 2008;9 Suppl 1:S3-9. doi: 10.1016/S1389-9457(08)70010-8. [PubMed: 18929317]. 38. Mansouri A, Mokhayeri Y, Mohammadi Farrokhran E, Tavakkol Z, Fotouhi A. [Sleep quality of students living in dormitories in Tehran University of Medical Sciences (TUMS) in 2011]. Iran J Epidemiol. 2012;8(2):71-82. Persian. 39. Brosschot JF, Gerin W, Thayer JF. The perseverative cognition hypothesis: A review of worry, prolonged stress-related physiological activation, and health. J Psychosom Res. 2006;60(2):113-24. doi: 10.1016/j.jpsychores.2005.06.074. [PubMed: 16439263]. 40. Espie CA, Broomfield NM, MacMahon KM, Macphee LM, Taylor LM. The attention-intention-effort pathway in the development of psychophysiologic insomnia: A theoretical review. Sleep Med Rev. 2006;10(4):215-45. doi: 10.1016/j.smrv.2006.03.002. [PubMed: 16809056].